05.11.2014. The wine tents in Rike Park encouraged wine lovers who visited the country’s most colourful and spectacular two-day festival – Tbilisoba, the celebration of the diversity and history of the capital city Tbilisi – to sip the Georgian wine offerings produced from all winemaking regions of the country. Sampling, sniffing and savouring Georgian wines in Tbilisi is not rare occasion but when revellers can try samples of the country’s top wineries, taste some of the hundreds of wines on offer, and get the chance to take some home to enjoy at a discounted price, then it’s well worth it to enjoy a fun day at Wine City. Some of the labels on show were Mukuzani, Shumi, Kindzmarauli, Iberiuli, Kakhuri and Qvevri Wine. 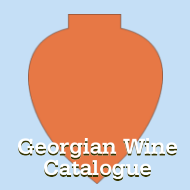 The ancient history of Georgian winemaking, including the Qvevri wine-making method, is the most cherished cultural treasure of Georgia and has recently joined the UNESCO heritage list. Brandy, as well as Chacha, a Georgian traditional spirit drink produced from the remains of the squeezed grapes, were also served at Wine City. Meanwhile, Davit Korakhashvili who represented Chateau Telavi winery with a smile on his face, tirelessly talked to visitors about Georgian wine varieties presented by the company at the festival. For people who loved to try traditional Georgian wine, Korakhashvili offered guests the chance to taste Kakhuri, a white dry wine with high tannin. "Kakhuri is a very interesting wine. We have a secret recipe to make Kakhuri wine. It has a different taste and dark colour and could be served during a celebration. The label of the bottle is also distinguished as it is painted by Georgian artist Zurab Janiashvili,” he said. 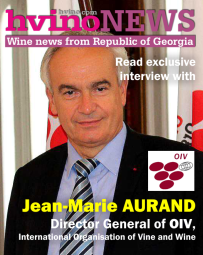 Korakhashvili was surprised that there was a great demand to taste rose wine because it was not a traditional Georgian variety. 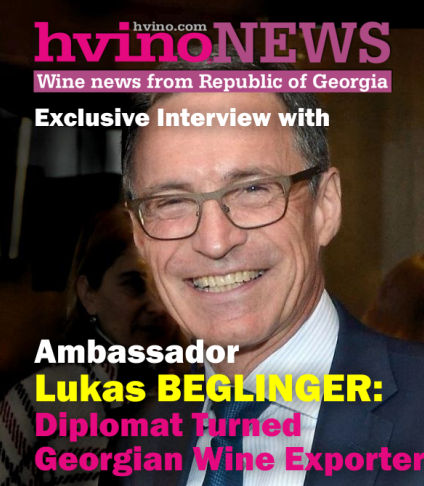 "It is interesting that Georgians are also interested in rose wines, mostly women,” he said. Cocktails made from Chacha gained special appreciation from festival guests. 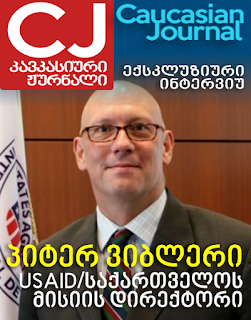 It was even an innovative and new taste for Georgians. 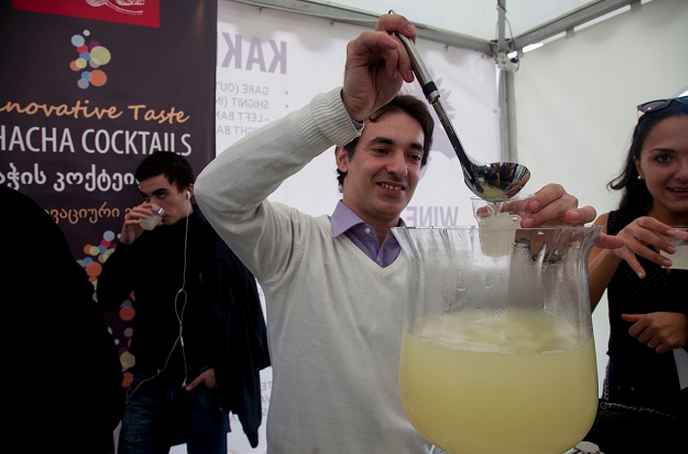 The author of Chacha Cocktails, Giga Kasradze, proudly poured his creations into revellers’ glasses said these cocktails were not aimed at getting people drunk but to instead enjoy the taste. "We offered three kinds of Chacha Cocktails. 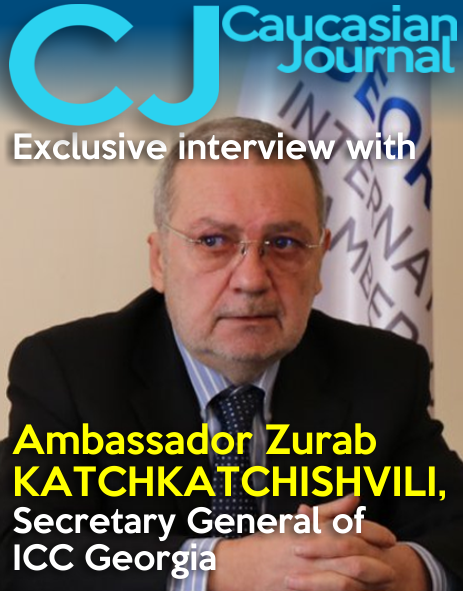 One of them is called 8000 Years Ago because the roots of Georgian viticulture have been traced back by archaeology to at least 6000-8000 BC,” Kasradze said. The Wine Parade was one of the most enjoyable events of the festival. Georgian artists dressed with traditional costumes performed their way from Metekhi Bridge, one of the oldest bridges of Tbilisi, to Wine City, where the parade was greeted by special guests including the Mayor of Tbilisi Davit Narmania. A busy two days of tastings ended in the Georgian Wine Competition Tbilisi 2014, where a competitive jury revealed the best wines in 16 categories. A group of journalists also revealed their favourite wine. 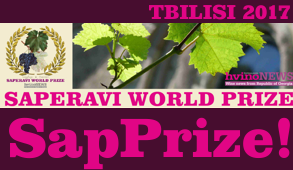 Best Premier Saperavi - Badagoni, Telavi Wine Cellar, Teleda, Mildiani.